Interior Paint in Norton, MA: How to Select the Best Products | Boss Services Inc.
. You can’t just walk in to a store, pick the colors that you like, select from quality name brand paints, and hope that everything will come out okay. More and more home owners are choosing to hire a Norton professional painter to take care of residential interior painting. If you want great results without any streaking, lines or other common issues seen in non-professional painting mistakes, contact Boss Services residential and speak with one of our painting experts. The amount of time it has been since your home was last painted, combined with the condition of the walls themselves, has a lot to do with what products and tools will be required to get the results that you desire. 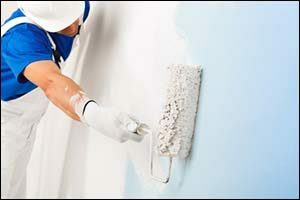 A basic gallon of paint might cost you $20, but if you also need to get primer to cover over the existing hue, as well as patch, caulking and other materials required to make some basic repairs, the cost goes up exponentially. If you want any premium type paints, such as eco-friendly, odor-free or primer-and-paint-in-one type products, add another $10 or more to each gallon. How many gallons do you need? It is important to know how to effectively gauge the number of gallons you will need to paint your bedroom, living room, kitchen or bathroom. You also need to know what type of paint will work best in each type of room, such as flat, eggshell, latex or semi-gloss. There are different types depending on the use or function of the room, such as a bathroom that gets a lot of moisture or a kitchen that might have a lot of grease in the air. Bedrooms can be flat paint, but if you have kids you will want a washable paint, so there is still more to learn before you will know that you have the right paint. When it comes to selecting the best color for your home, it pays to work with a professional who is experienced with interior paint in Norton. Boss Services residential has designers and experts on our team that can help you choose the best shades of our quality name brand paints. We work with Sherwin Williams, Olympic, Benjamin Moore, Zinsser and Cabot Stains, to help give our clients the variety they need to get the colors and textures they want from our team of Norton professional painters. Step One – Gather some samples. Work with our team to help you find a selection of color types and shades that will best suit the overall design and style of your home. Warm colors, bright colors, whites and off-whites or darker shades, once you know the direction you want to start heading, the easier it is to make a specific choice. It helps to look at the colors and start comparing them to your furniture, carpets, flooring and window treatments, to make sure everything will work well together. Step Two – Choose a finish. Contact the team at Boss Services residential to select the best type of finish for your home. Glossy finishes reflect light, making the walls and the room appear brighter. Flat finishes absorb the light, which can make the paint appear darker. If you want something in the middle, select eggshell or satin finishes. Most of the interior paint colors work best with an eggshell or a satin, plus these types of paints can be washed and scrubbed, which is great in a heavy traffic area or in kids’ rooms. Step Three – Consider contrasting colors for the trim or as a focal point. Many decorators are suggesting the use of a contrasting, yet complimentary, color for a smaller wall or a focal point wall in the room. While white or off-white trim is still very much a popular choice for residential interior projects, some home owners opt to use other colors. Step Four – Pick the best brand. Much has changed in the paint industry. There are now high-tech paints that can be used to cover even the darkest or brightest colors with just a single coat. There are also odor-free, environmentally friendly options that you can use that will eliminate that paint smell from the equation. Work with one of our Norton professional painters to choose the best quality name brand paints for your residential project. Whether this is part of a larger remodeling project, or as a stand-alone upgrade, it is important to pick the best materials if you want to get the best results. If you are interested in learning more about upgrading your interior paint in Norton, whether you have a residential or a commercial property, contact our team by calling 508-297-0635. Since 1989, we have provided top quality services and craftsmanship to property owners throughout the Southeastern Massachusetts region. Whether you require the services of one of our North professional painters or if you require our Boss Services for residential remodeling and renovations, our team can help you to achieve your goals. Call today to learn more about our quality name brand paints or to schedule an appointment with one of our agents.